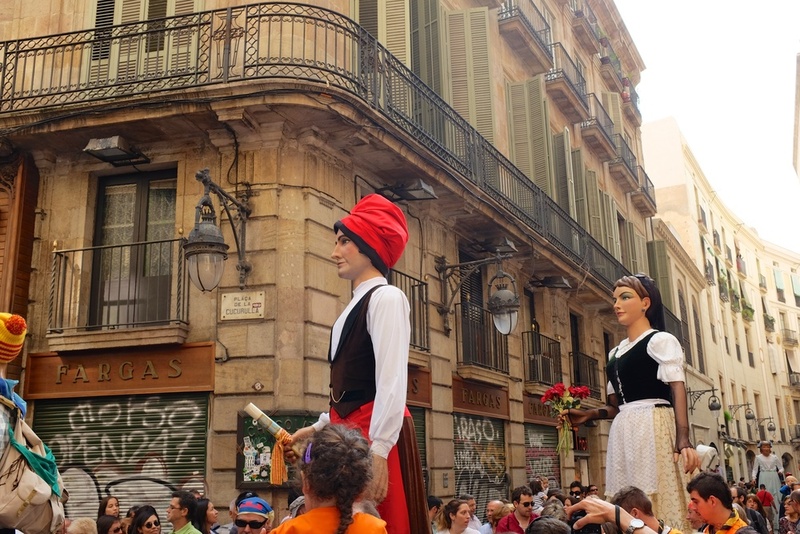 Today was the last official day of La Merce 2014 Festival here in Barcelona, and it was surely very exciting. Schools and most businesses were closed for the day to allow everyone to attend the festivities. 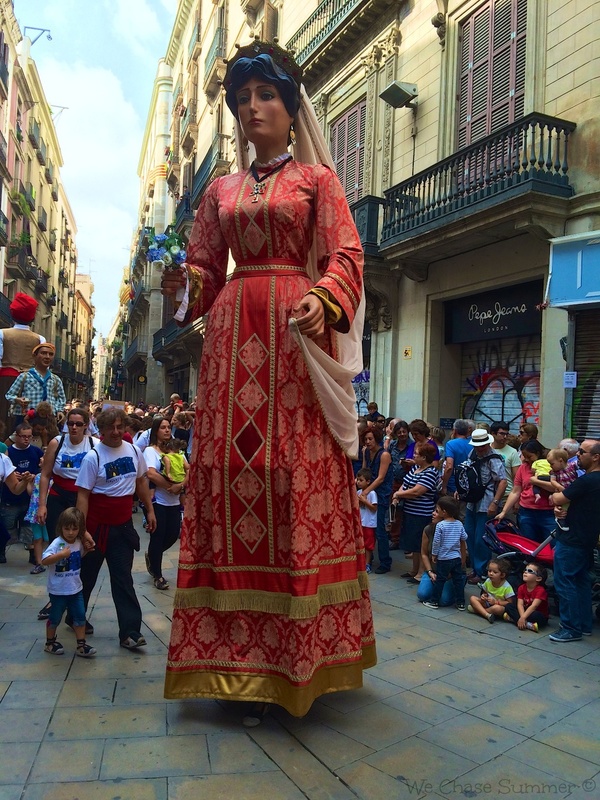 We headed out in the morning to check out the human towers in Placa Jaume, and on the way encountered another procession of the Giants. Some of these were different than the ones we saw during the parade last night. We were glad we had seen the parade already because as you can see from the pictures below the place was very crowded. 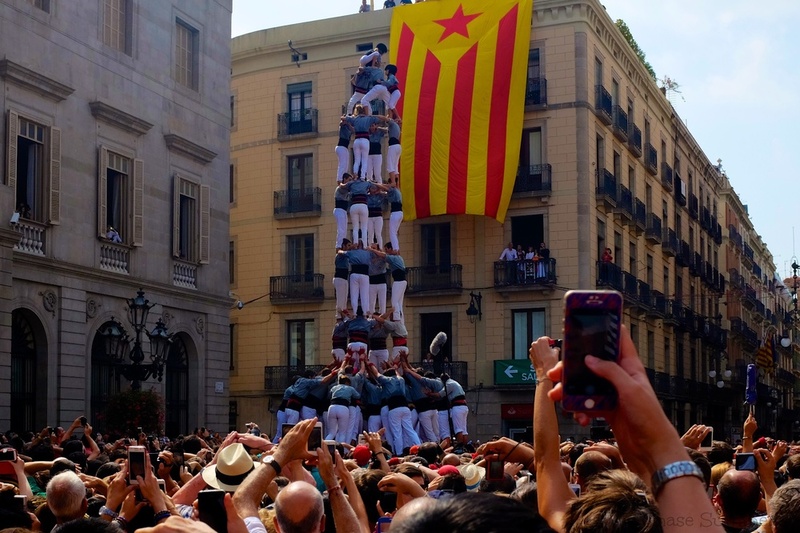 We made a quick get away from a side street and arrived at an even more crowded Placa Jaume to watch the human tower competition. 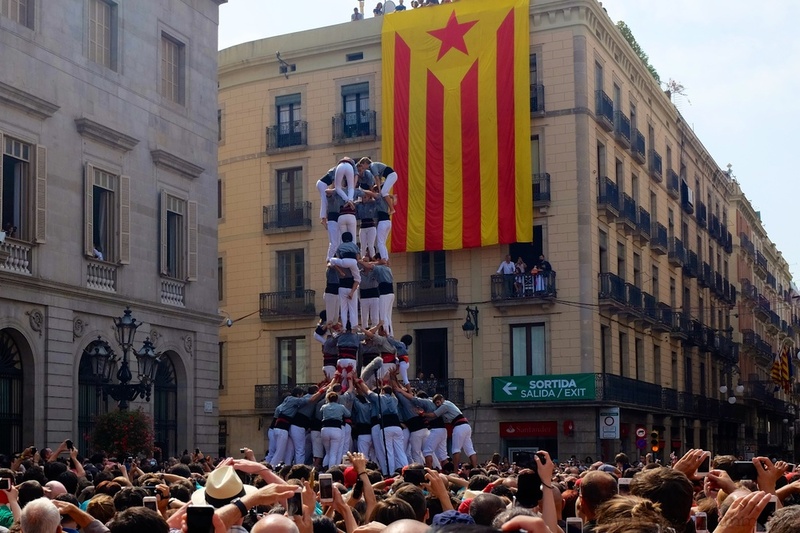 Every year during La Merce, Catalans follow tradition and participate in building or watching the human towers. The goal of the competition is to build the highest tower, and for everyone to dismount successfully without anyone falling off. The craziest part is that a tower is not considered complete until a child (around 4-7 years of age) climbs to the top of the tower and makes a hand gesture called "aleta" to signal the tower is complete. There are no suspended support ropes or really anything to protect these tower builders from fall off. Apparently in the last 100s of years of competition only 2 deaths of been reported, which I guess isn't bad compared to other types of sports. What helps is the sheer number of people, both in the tower and surrounding the tower, so if someone falls its almost like stage diving. The child that climbs to the top does wear a helmet, if that makes you feel any better. For me, every time I saw the child climb all the way up my heart was pounding! I also got very nervous when I saw the people in the lower layers start to shake. Low and behold not a single tower fell while we were there! These guys, and girls (yes there were many girls), are very strong and agile! The tallest tower ever built in the history of human towers was approximately 10 stories high!! There is a monument near Placa Jaume dedicated to that tallest tower. To get an idea of how this tower building is done, watch our video below. It was a hot day and the square was very crowded. Truth be told, I was feeling a bit of crowd phobia, but that soon melted away when I realized that people were generally very respectful and there wasn't too much shoving and pushing involved once we found a spot away from the street leading into the square. In the beginning there were a few shorter towers and we thought, hmm..is this it? This is not very impressive...but then they started to walk!! 6 people standing on each other's shoulders walking down the square!! Overall, the entire event was remarkable, and obviously unlike anything we have ever seen! 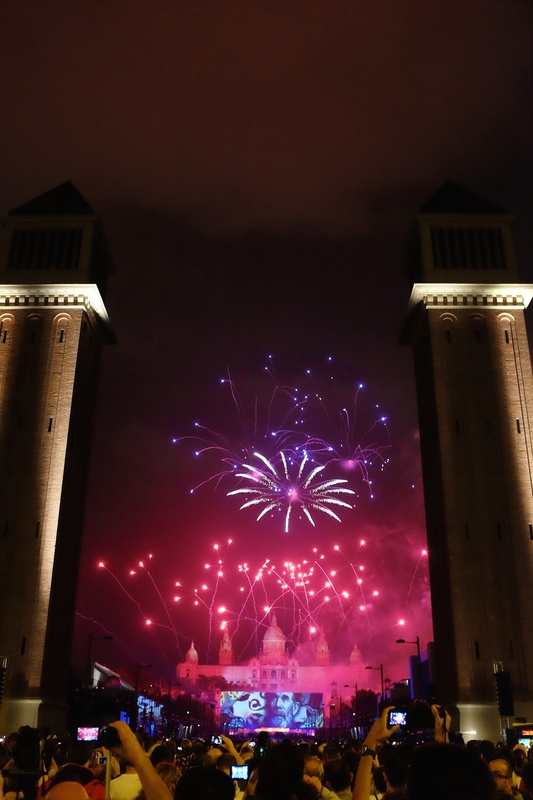 At night, we walked over to Placa Espanya, which is a little over a mile from our apartment, to watch the amazing fireworks at the Magic Fountain. We were told that the event is amazing and to make sure we don't miss it, that it was within walking distance made it something we couldn't pass up on. I think we got there at the right time (about 30 minutes prior to the start of the event). It was crowded and we were nowhere near the front, but from were we stood we could see the fireworks framed very nicely by the towers at Placa Espana. I also loved that the MNAC (Museum of National Art of Catalonia) was lit up in white. Within minutes the entire square was packed with people. Though there was rain in the forecast, the weather remained nice, the air was cool, and everyone was in a spirited mood. There was no pushing or shoving and everyone was very friendly with the kids. The show began promptly at 10 PM. There was a large screen up front which was showing various video clips to audio during the performance. One of the things that made the fireworks very special was the choice of music. I loved listening to the Catalan music and narration as the beautiful sparks lit up the sky. At some point in the middle of the performance, a short speech was played and all around us people started lighting up sparklers. The speech was in English, so I was able to research it after the fact and find out what it was all about. The speech, called I am a Catalan, was given by Pablo Casals (a famous Catalan cellist and conductor) on October 24th, 1971 in front of the General Assembly of the United Nations. The sparklers were lit as a symbol of hope for peace, justice and freedom. It was a wonderful night, and we are so grateful that we could be a part of it and experience it in person. We leave you with a few pictures from the most amazing fireworks display we have seen to date.